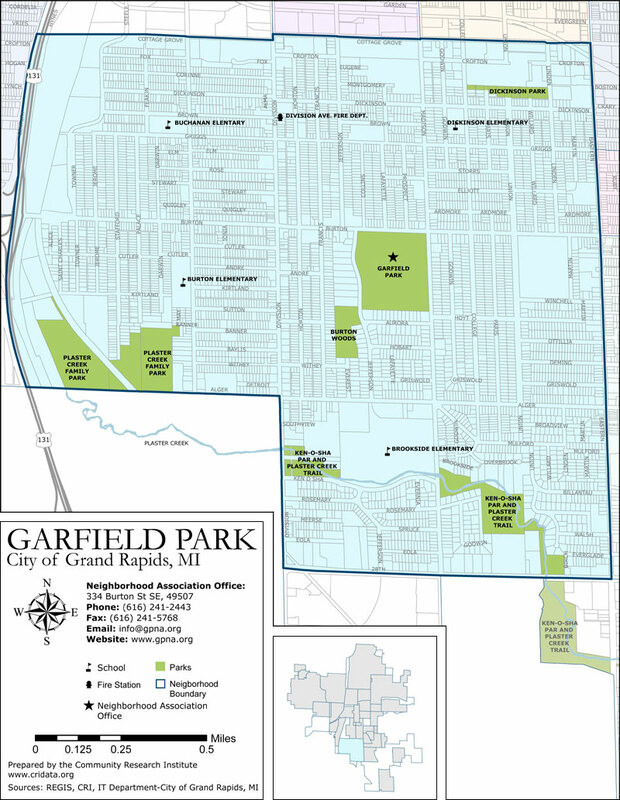 Garfield Park Neighborhood in Grand Rapids is bounded by Cottage Grove Street on the north, Eastern Avenue on the east, 28th Street on the south, and Division and Century avenues on the west. Features of Garfield Park include Garfield Park itself, Dickinson Park, Burton Woods, Plaster Creek Family Park, Ken-o-Sha Park, and Plaster Creek Trail. Elementary schools include Brookside, Buchanan, Burton, and Dickinson. Business districts include Alger Heights, Burton Heights, Madison Square, and Seymour Square. Garfield Park actually is several neighborhoods under the umbrella of the Garfield Park Neighborhoods Association. The largest are Garfield Park and Burton Heights. The combined neighborhood is the second largest by population in the city.